Last night proved that while transportation might not be a top issue in Portland politics these days, it still brings out the largest crowds. 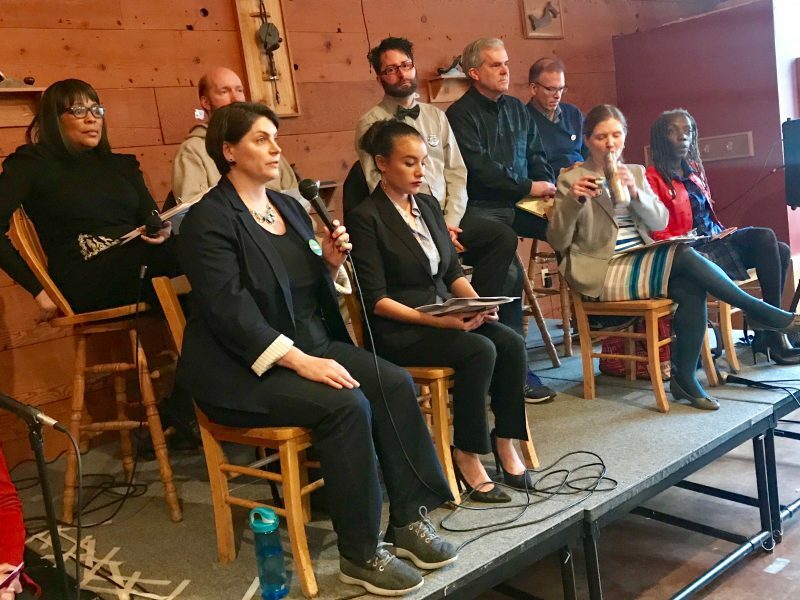 Due to the questions and the candidates themselves, there was a very strong focus on east Portland and how our transportation policies impact people from underserved neighborhoods where there’s a high proportion of low-income residents and people of color. Other ideas that were widely supported by nearly all the candidates were free transit for all and opposition to the I-5 Rose Quarter project (that will add lanes to the freeway). Nine candidates participated: four of them are running for position number two (currently occupied by Nick Fish) and the other five are running for position three (where Dan Saltzman currently sits). The position two candidates at the forum were: Julia DeGraw, Nicholas Sutton, Philip Wolfe, and Nick Fish. And the position three candidates were Felicia Williams, Andrea Valderrama, Jo Ann Hardesty, Stuart Emmons, and Loretta Smith. The moderator asked three questions that were given to the candidates ahead of time, and there were three questions from the audience. Time limits were strictly enforced. Candidates got two minutes for the prepared questions and one minute to respond to each audience question. Just part of the crowd. Question 1): In 2016, City Council adopted the Vision Zero Action Plan to eliminate all road deaths and serious injuries by 2025. However, last year 45 people were killed on our streets, making 2017 the deadliest year in over a decade. As most of these deaths occurred in historically underinvested neighborhoods, what concrete actions would you take to make our streets safe, especially for communities of color and other vulnerable populations? 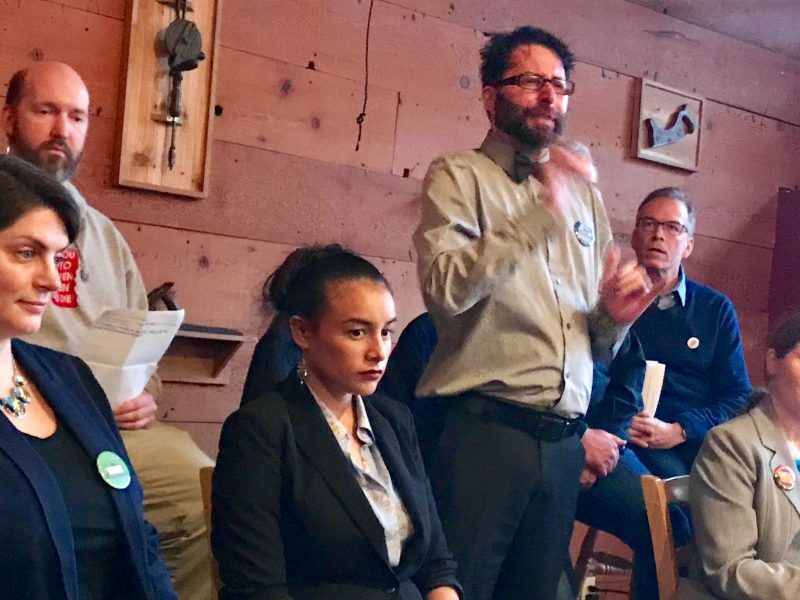 Andrea Valderrama, a policy advisor for Mayor Ted Wheeler who also worked for former PBOT Commissioner Steve Novick, was one of several candidates who repeatedly invoked their personal experience of living east of 82nd Avenue. “The fear of walking along big arterials in my neighborhood — like 102nd and 122nd — is really real,” she said. Valderrama had the most substantive answer on this question, outlining four ways she’d approach the problem: speed reduction, engagement, education and prevention, and technology. She wants the 20 mph residential speed limit to be expanded to arterials and is “interested” in speed cameras. Valderrama also said city meetings must be more accessible and culturally relevant. Commissioner Nick Fish seemed to take offense at DeGraw’s comment about a lack of leadership. “Let me thank the visionary leadership in this room that has actually put us on the map around a lot of innovative transportation policies,” he said at the outset of his remarks. Fish then relayed the story of losing his mom to a “car accident” when he was 11 years old. “As your city commissioner I’ll wake up everyday to try and prevent people from dying on our streets,” he promised. Fish then referred to Vision Zero as a “bold plan.” “But the problem with Vision Zero,” he continued. “Is we don’t have enough resources to implement it.” We could save money and prevent deaths if people would just slow down, Fish added. Philip Wolfe used his first answer to point out his experience of being passed by bicycle riders. “When I’m walking, people assume I’m a hearing person,” he shared through an interpreter, “and they rush by me.” “That’s a space where able-bodied people forget about people with disabilities.” He also mentioned that spending “Half a billion dollars for expanding freeways” won’t fix the “root problems” we face. Loretta Smith (upper left) answers a question. Question 2) Low-income and communities of color have been disproportionately burdened by our transportation policies, such as the construction and expansion of highways that have cut off their communities and displaced them from their homes. 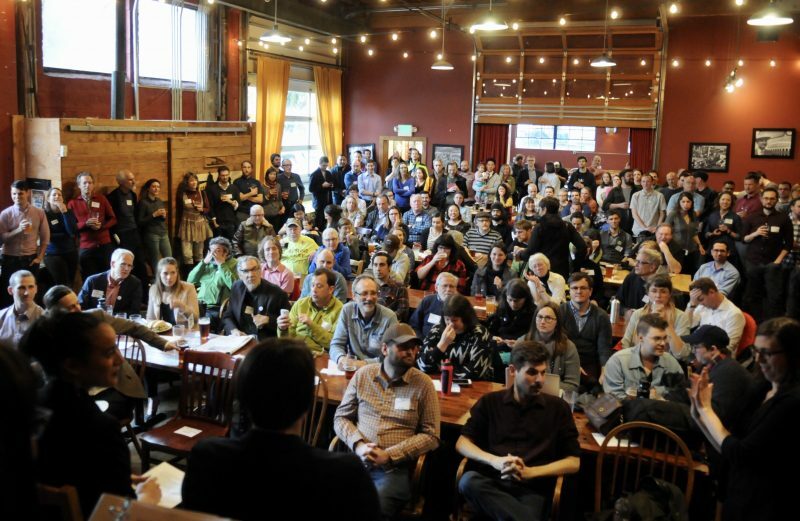 Given the urgency of climate change and Portland’s commitment to increase safe walking, biking, and transit connections in the 2015 Climate Action Plan, what policies would you enact to bring environmental justice to these communities? DeGraw also voiced opposition to the I-5 Rose Quarter project and focused her answer on diesel toxins from trucks. “Low-income and communities of color are hit hardest with diesel particulates,” she said. “And not only were many of these communities displaced by freeways, now they are living along freeways that are poisoning them.” DeGraw wants Oregon to step up its standards for diesel emissions to Washington and California standards and she advocated for a local air-quality task force. Current Multnomah County Commissioner Loretta Smith said I-5 runs right through her district and causes a lot of asthma and respiratory problems among her constituents. But she didn’t express an opinion on the I-5 Rose Quarter project — likely because she supports it (as she clearly says on her website). 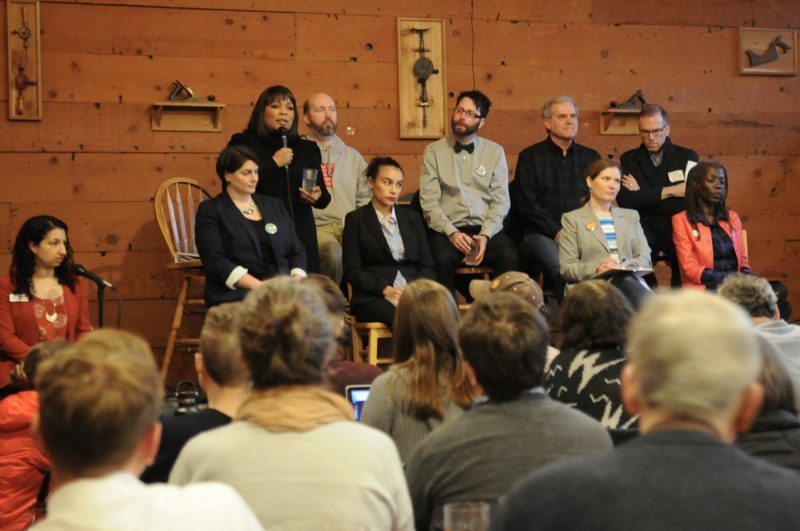 Instead Smith focused her answer on how “We have to get this transportation thing right and figure out where the toxins are.” She mentioned toxic buses and her belief that TriMet needs to make more of them electric. Question 3) We’ve talked about Portland’s dangerous streets and transportation injustices. However, a significant barrier to addressing these challenges is the fact that most of our streets and funding are dedicated to moving and storing automobiles. If elected, how would you reallocate the City’s road space and transportation budget to prioritize walking, biking, and transit? From Andrea Valderrama’s point of view we can’t forget that in some parts of town, where people don’t have good transit service or bikeways, people are “forced” to use cars. She advocated for more “Creative use of the right-of-way so people are safe in alternative modes of transportation other than car usage.” Valderrama wants to redesign streets with the understanding that, “Curb space isn’t just for parking your car, but for all types of users.” She wants separate loading zones for ride-sharing companies like Uber and Lyft. Jo Ann Hardesty speaking with Julia DeGraw to her right. Commissioner Fish brought up “20-minute neighborhoods,” saying we must expand walkability further afield. But alas, the veteran politician added, “We simply don’t have enough money to build out the infrastructure for all the plans we’ve adopted — starting with the Bike Master Plan and going forward, so we’re going to need new revenue.” Fish said with dwindling funding prospects from Washington D.C., it’s time to throw our support behind a “multi-billion dollar regional bond measure” that he suspects will be proposed in 2020. Philip Wolfe stands as he signs his points. Interpreters were on hand so Wolfe’s ideas could be heard. Audience question 1) What specific solution will you propose to solve the problem of pedestrians dying in east Portland? Williams answered this by saying “It’s a simple fix” and that all need to do is spent $8 million a year citywide. Valderrama repeated her idea of expanding the 20 mph residential speed limit to arterials and she pointed out her work (during her time with former Commissioner Novick) getting safety upgrades on SE 122nd that led to TriMet upping frequency on the bus line. Audience question 2) How would you fund all the stuff you’ve talked about tonight? Williams said we should look to the example of Copenhagen where they created an “urban wealth fund” for their harbor. The city maintained ownership of the harbor then sold development rights to private companies and poured that money back into transportation infrastructure. 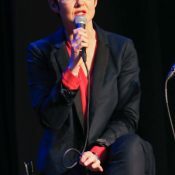 DeGraw advocated for higher taxes on large companies and a “wealth tax.” She also said she’d be “curious” about shifting the governance of TriMet to Metro. Audience question 3) Congestion pricing is a controversial policy that effectively manages traffic while generating new revenue. If the policy comes to Portland, how would you address the impact of congestion pricing on low-income populations while increasing access to transit? Valderrama wants to make congestion pricing “as progressive as possible” and she mentioned that we must improve transit in tandem with it if we really want to reduce traffic. If you prefer to listen to the event, here’s the audio. What did you think about the candidates? Did you come away with a new favorite? Did any of them help or hurt their election chances in your eyes? Andrea Valderrama spoke eloquently, passionately, and truthfully about her aims for reducing traffic deaths, especially in East Portland. She seemed the most poised from position 3 candidates. Julia De Graw took it to Nick Fish, though nerves seemed to have got the better of her early on. 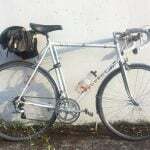 I’m sure everyone who comments on this blog always walks their bike after a few pints. Not excusing bad behavior, but people do learn from their mistakes. I somehow survived my teenage years and my experiences do not disqualify me from being a good person later in life. 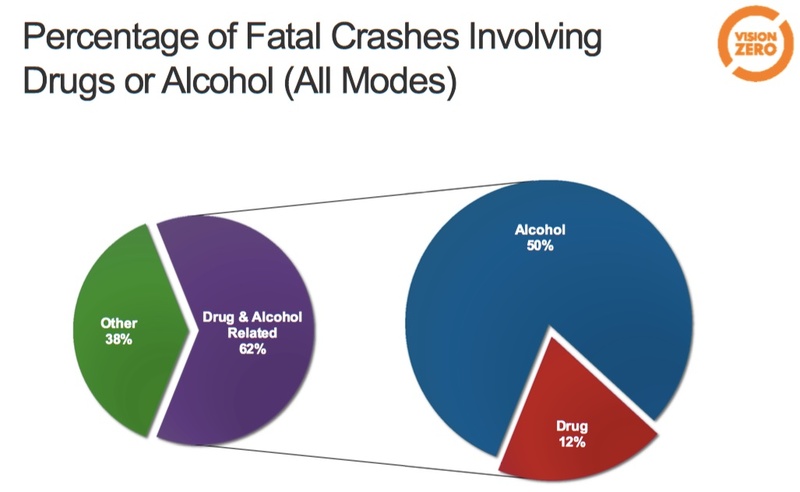 Please don’t equate biking drunk to driving drunk. Or their car for that matter. I couldn’t attend so i look forward to reading more here. Only reaction from what I’ve read so far: 20 mph on arterials may be popular in certain groups but outside the echo chamber, its a non starter. I respectfully disagree with Commissioner Fish. If we have the money to cover Pland streets with bollards and paint (we do), we have the ability to redesign any space we want. Street safety has virtually nothing to do with budget and everything to do with leadership. Minor correction on question 2: I believe Andrea Valderrama said her daughter was 3 months shy of being 2 or 3 years old, not 3 months old. Her campaign site refers to her 2 year old daughter. Please vote. And please DON’T vote for Nick Fish or Loretta Smith! I remember Smith saying that 40% of air toxins came from busses. Maybe I heard wrong, but I’d like to fact check that. yes. she did say that. not sure if it’s true or not yet. That 40% stat might be for all transportation emissions, not sure. I do like electric busses, but heard very little mention of dedicated transit lanes from any of them. I wish we could add 3 out of the 4 #3 candidates. Why even bother checking this? It’s ludicrous. Diesel vehicles pollute more than petrol in some ways, it’s true, and larger vehicles pollute more, but freight trucks (which are also large and usually diesel-engine) far outnumber busses on a typical street. 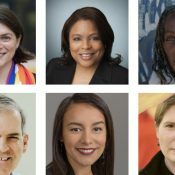 Best selection of Council candidates in a very long time! I have worked at photography for 60 years, JM, but never have I got a shot like that of Nick Fish in rapt attention to Philip Wolfe. I’ve heard a lot of hype around Hardesty in progressive circles and I’m REALLY disappointed with the victim blaming and the notion that tickets are too punitive. I argue they’re not punitive enough, as there is this sense among Portland drivers that they can run red lights and speed at will with no risk of getting caught. There is essentially no enforcement currently. I like Valderrama’s suggestion of more speed cameras lining arterial roads. Those cameras don’t come with police bias, and in my view, are the fairest approach to enforcement as a major best practice in Vision Zero. You can’t support Vision Zero and then imply the enforcement measures are too punitive as Hardesty is doing. The problem in East Portland is a LACK of enforcement, and to many, a bias in the little enforcement we have. Cameras along 82nd, Powell, and elsewhere would help resolve both of those issues. That has to happen before any major redesign of those roads (which I 100% support), because the latter is likely years away given jurisdictional differences. Yeah, and the idea that congestion pricing is inequitable – even if the pricing is income-indexed and the poor are exempted – seems like an off-base gut reaction. I get that much of Portland’s Black community has been pushed further out – but those who live further out and drive or bus at congested times are already paying a congestion tax denominated in hours spent in traffic. Wouldn’t it be an improvement to give poor Black folks who drive or take the bus their time back (and give non-poor Black folks the option to pay to get their time back)? Congestion pricing in Portland should be focused on traffic entering from Clark and Washington counties (that’s where most of the traffic is to/from) and use a Fastrack type system. Anyone receiving SNAP benefits could automatically get discounted Fastrack, so they would pay less or no congestion fee. Much like Eudaly, she appears to be a single-issue candidate. Much like Eudaly, she would be a poor choice. Hardesty’s work on PJET and police accountability is a single issue? 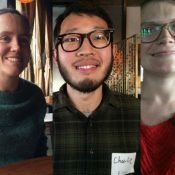 Portland needs candidates who does not take large donations from wealthy interests and corporations -and who does not represent business as usual. Exactly. This isn’t a single issue, this is a lens we should be applying to EVERY issue. If you disagree with Jo Ann’s stance on transportation issues (*especially* when you disagree), I urge you to think more about why she might have arrived at it. And I would add that until we learn to consistently apply this lens, our efforts to build bridges with advocates in communities of color will continue to be regarded with skepticism. Enforcement is a good example of this and Jo Ann is far from alone in her concerns. The Vision Zero Task Force came to the same conclusion last year. Until we deal with racial profiling, increased police enforcement is going to have disproportionate effects. We saw this just last week when we learned that an audit of the city’s efforts to curb gang activity revealed rampant racial profiling. Speed cameras have potential, but unless they are at every corner they too will have bias in where they are placed (see this study for a thought-provoking example http://www.chicagotribune.com/news/columnists/ct-red-light-cameras-race-turner-20151103-column.html). Finally, we must consider how the financial and judicial effects of a getting traffic ticket might also perpetuate inequality. Doesn’t lining arterials with speed cameras, through wealthy and lower income neighborhoods, do away with that racial profiling? I’ve yet to see a real counter to that proposed solution. It seems to me that Hardesty wouldn’t even approve of speed cameras. So let’s just reduce penalties and enforcement, then scratch our heads as to why more people are dying on our streets. I know Hardesty is a strong advocate on other issues, but this is just head scratching and deductively invalid logic on her part. first of all, this is explicitly illegal according to state law (only a limited number of cameras on an even more limited stretches of roadway are allowed as an “experiment”). secondly, dangerous arterials are disgustingly concentrated in neighborhoods where poc and other marginalized folk live (largely due to displacement). 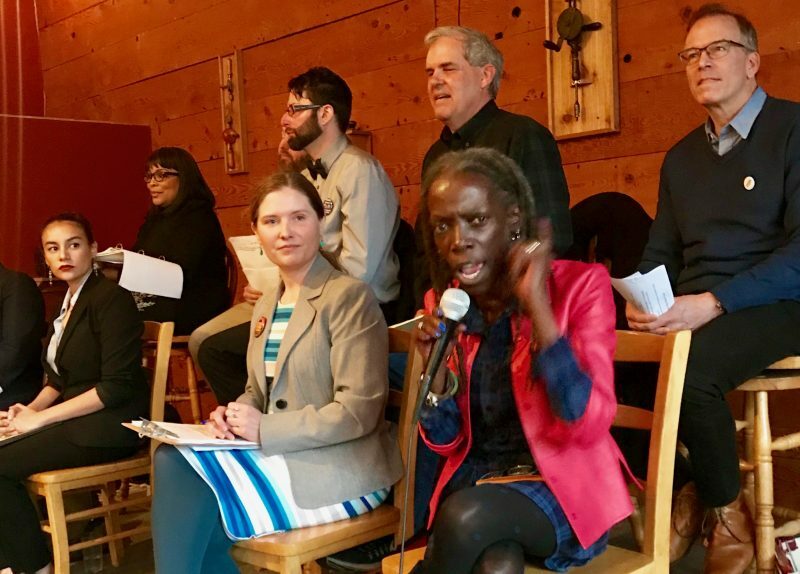 hardesty is a long-time supporter of transportation alternatives to SOVs and i am confident that she would support speed-calming infrastructure that takes equity into account. supporters of transportation alternatives should not shy away from tough conversations about equity if we want to create a united front against regressive SOV-centric politics. How long will it take to get that speed calming infrastructure? That’s the problem here. Cameras can go in long before any of that re-engineering will happen. It’s taking the city over TEN YEARS to redesign Foster (with massively substandard bike lanes). I hear you about the legality of it, but I’m curious whether an emergency proclamation can trump that? I’m guessing not, but curious. My concern with Hardesty is that it will be lots of talk about what needs to happen on a grand scale but I don’t see any vision from her with specifics and an utter lack of anything about transportation on her website. I think the clear short term answer IS more enforcement, as recommended by the founders of Vision Zero, and if it can’t be cameras, then we need to really train officers better to reduce their bias (implicit or otherwise). This notion that tickets are too punitive, and let’s not enforce at all while we lack properly engineered roads, is a dangerous path to go down. I foresee more victims of road violence with that sort of mindset at council. 1) Splitting the vote has no direct effect on getting Fish elected. Turning people out to vote for Anybody But Fish is the way to force a runoff, then at that point the candidate is clear. this flies in the face of everything i’ve read about vision zero. Julia De Graw is running against Fish for position 2. The other candidates were running for 3 no? alex, splitting the progressive vote between hardesty and valderrama could result in a loretta smith vs stuart emmons run off. and, fwiw, valderrama is my #2 choice. Oh yeah, forgot which positions people were running for, and forgot Saltzman wasn’t running, and conflated all the incumbent white dudes. Thanks Soren and co.! Ugh, you are probably right that Valderrama does not have enough votes to make the runoff. And Emmons seems to have enough money to buy votes with his lies about affordable housing. But Smith? Yeah, she has name recognition, but she’s gotten a ton of bad press recently. You’re definitely making me consider tactically voting for Hardesty though. I was disappointed by Hardesty’s answers but I do understand her desire to not disproportionately penalize poor people and people of color. 1. She mentions an education approach- PSAs alone will not change people’s behavior without some kind of enforcement. Fines may not be the best deterrent but a hands-off, please be a good driver oh won’t you please approach is not enough. 3. Blaming pedestrians over drivers is the wrong approach. Many of the people being killed by cars are the same people she is looking to protect, i.e. poor people and people of color. 5. She’s against congestion pricing but for taxing consumers for using Lyft? I don’t own a car, and make below the median income. I use those services because TriMet does not run all night and to everywhere I want to go. These are safer alternatives to drunk driving and this tax will penalize the drivers as well (many of whom are lower income people of color). Are Lyft and Uber the ones largely to blame for our congestion problems anyway? Single occupancy vehicles should be the ones paying a punitive tax, if anything. 5. Single occupancy vehicles? Uber and Lyft are not an improvement on SOV, they are the same number of SOV + intermittent bursts of driver trolling for a passenger. It’s hard to tease out the economics of fares and taxes but if you could ever be sure the tax was on the company and not the drivers I would support that. There are lots of unintended consequences in this game. Once an Uber has a passenger, it is by definition not an SOV. Ms. Hardesty said charge a $2.50 tax on Uber and Lyft. Why just Uber and Lyft and why not other for-hire vehicles? When they don’t have passengers why single them out of other SOVs? Congestion is a problem but it is not solely caused by ridesharing services- and seems to only punish the consumer. Using a cab already costs much more than Trimet, why make it more expensive for people without cars to get around when trimet is not an option? I would also be ok with a tax on the corporations that went to a pedestrian, bike and pub trans fund- but that is not what Hardesty said. Sorry, unless the driver is also getting out of the car with the Uber/Lyft passenger, and they have the same destination, it’s a SOV. I’d also like to see how many Uber/Lyft rides are for one person vs. multiple. Then why not support congestion pricing for all SOVs, rather than a $2.50 tax for all Uber/Lyft rides as though they are the main culprits of congestion? What societal negative do Uber trips have that owner/driver trips don’t? Trolling for a fare is of course wasteful but it seems that this could be clamped down on with more specifically targeted measures. Also, trolling for a fare is not nearly as socially costly as the immense amount of public land given to parking for people’s non Uber/Lyft vehicles at free or subsidized rates. Uber/Lyft boost congestion significantly. They’re usually used as a substitute for transit, walking, or biking. They’re a single-to-zero-traveler vehicle, worse than an SOV. “One of the main reasons that these people stated that they’re using Uber and Lyft is because public transportation is unavailable or is poor,” Henao said. Uber and Lyft “could be part of the solution for better transportation systems,” Henao says. They could also help cities treat their expensive and space-hogging parking addiction, Henao said. If only they _would_ park instead of stopping suddenly in traffic lanes. Burning more fuel doesn’t seem like a good fix for a land use problem. Yeah, tickets are not punitive enough obviosusly considering the epidemic of hazardous driving. I don’t kno what world she’s living in that higher citation amounts equals more harassment of POC. So far, I am thrilled with Valderrama and Degraw! Thanks for this amazing coverage! According to the Census, Portland is 76% white, but the forum indicates that Portland is nearly 100% white, based upon the photos above. There are in Portland somewhat more women than men, but the forum was over 60% male in the photos. 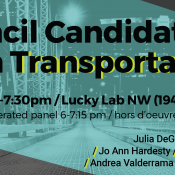 So I can imagine the challenge of some of the non-white non-male candidates had during the debate, aside from the normal discomfort candidates have for city budgets, transportation issues, and reality. This is a great read! Thanks for sharing it Soren, it really presents a strong contrast from how Portland City Council currently talks about VZ (ie expecting a change in behavior from ‘irresponsible’ road users). That’s honestly the first I’m hearing that. My understanding has always been that enforcement was part of the Swedish strategy, with a much bigger emphasis on design. What was that regressive, biased, third E, again? Thanks to Sumi Malik for moderating and to all who participated.